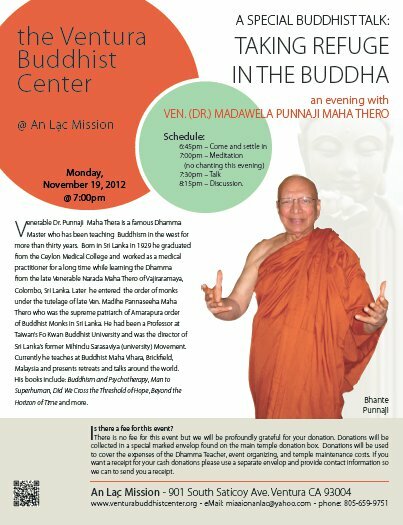 Venerable Dr. Punnaji Maha Thera is a famous Dhamma Master who has been teaching Buddhism in the west for more than thirty years. Born in Sri Lanka in 1929 he graduated from the Ceylon Medical College and worked as a medical practitioner for a long time while learning the Dhamma from the late Venerable Narada Maha Thero of Vajiraramaya, Colombo, Sri Lanka. Later he entered the order of monks under the tutelage of late Ven. Madihe Pannaseeha Maha Thero who was the supreme patriarch of Amarapura order of Buddhist Monks in Sri Lanka. He had been a Professor at Taiwan’s Fo Kwan Buddhist University and was the director of Sri Lanka’s former Mihindu Sarasaviya (university) Movement. Currently he teaches at Buddhist Maha Vihara, Brickfield, Malaysia and presents retreats and talks around the world. His books include: Buddhism and Psychotherapy, Man to Superhuman, Did We Cross the Threshold of Hope, Beyond the Horizon of Time and more.